Today we shipped about 15 lbs. to Santiago using a service from the post office. Tha treduced the weight we would have to carry over the mountains. I also got my bike fixed (again!). That made us leave town around 10:30. The ride was a steady climb all the way to Las Herrerias. During the ride we had some light rain and some sun. The way was trhu small pictoresque villages and a very green forrest. We met some of our Camino friends and exchwnged some small talk and Buen Camino wishes. We stopped one last time before our big climb. And then the rain started. We got our rain gear and went off to the climb. Soon the rain stopped briefly. And then it just com back down hard. We were wet to the core in no time. 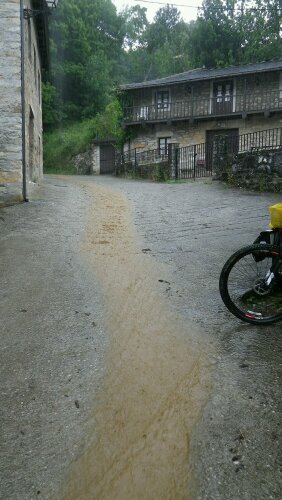 Due to the amount of rain we ended stoping at La Faba and waited for the rain to stop under a house ledger. 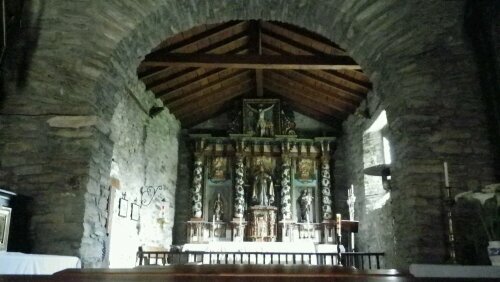 We then resumed our way to O Cebreiro. The rain soon resumed. We made yet another stop at La Laguna for a quick snack. 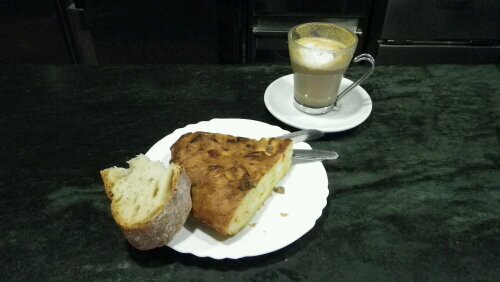 A tortilla de patatas and cafe con leche. Then the fog hit. 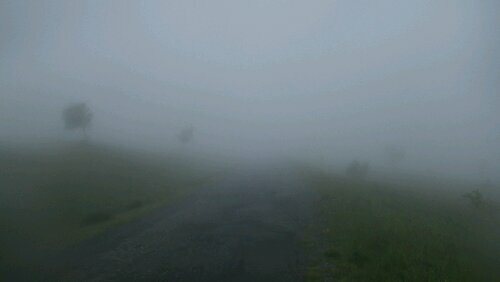 We could barely see where we were going. But we made it to the top wet and cold. We initiated our descent only to find out that there were more climbs before we could finally make our way down to Triacastela. We arrived around 6 PM wet and cold. We had a hard time locating a place to stay. This was a long, cold and wet day. We rode 56 wet kilometers. 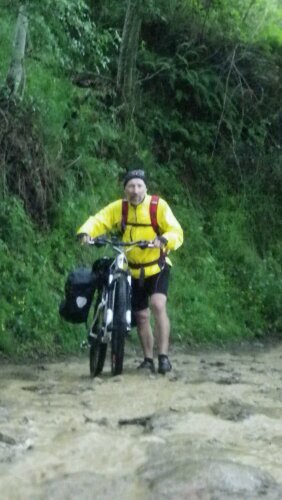 That put us at 130 km from Santiago. So close I can feel it. Bob estimates that we have 2 or 3 more days before we are there. Let me remind you that when we started we where at 777 kilometers from Santiago. Wow! I hope tomorrow the weather will be more kind to the pelegrinos and bicigrinos (us). As always, wish us a Buen Camino for Tuesday. One Response to "Day 11 – Villafranca de Bierzo to Triacastela"
Brings back some great memories I reeebmmr sitting in the plaza at Ponferrada fun to watch the pilgrims wander into town, catch up with those they had walked with over the last few days .